These two teams know each other very well and they faced off against each other in last season’s campaign. The Spanish side were triumphant in both of the games and they will fancy their chances of winning again. 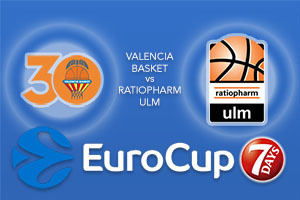 However, the games were close affairs so there is nothing to suggest that this will be a one-sided affair or beyond the reach of Ratiopharm Ulm. There are a number of key players for the Spaniards and the playmaking skills of Sam Van Rossom and Antoine Diot will likely be at the fore for the hosts. There is also the fact that players like Rafa Martines and Guillem Vives have the ability to rack up points which means the hosts will fancy their chances in getting out in front in this game. Romain Sato and Vladimir Jankovic should also be big players for the Spaniards and you can expect the home crowd to make themselves heard over the course of this evening. When it comes to basketball betting excitement, this is a game that is well worth checking out. Ulm will take a lot of comfort from the fact that they have retained much of their squad last season, and they performed pretty well over the course of the season. They managed to make the Last 32 of the EuroCup and they also made the Finals of the German League. Another season along those lines would be very welcome for the Ulm fans. There have been three major signings over the summer with Tim Ohlbrecht coming back and Dominique Sutton, who reached the EuroCup semi-final last season with Trento coming in on a short-term deal to provide cover for Augustine Rubit who is injured. This could be another decent campaign for the Germans and they’ll want to get off to a great start. However, the bookmakers think that the Spanish side are going to clean up in this game and they tip Valencia to win big. With that in mind, back Ratiopharm Ulm at +11.5, which is on offer at odds of 1.90. When it comes to the Over/Under market, go UNDER 169.5 which you can find at odds of 1.90. Bet Now!